I think dancers know that every time they dance, be it for the public or in a rehearsal studio, they are celebrating Dance. It is a matter of body and mind coming together to make one forget all else for those magical minutes....hours, whatever. Celebrating Dance worldwide is quite a concept. Many events took place everywhere I believe, and brought the focus on Dance in India to new levels of appreciation and involvement. I had a ringside view of one dance school going all out to celebrate dance. They did it with style, dedication and joy. Natya Vriksha of New Delhi and the founder Geeta Chandran are famous. A dancer of renown, she had her training with Swarnasaraswati, and later Dakshinamurthy Pillai. 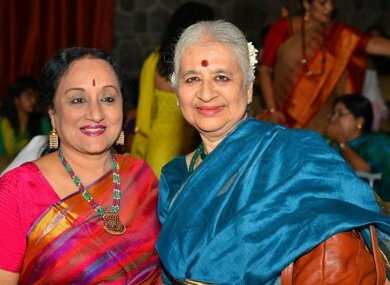 Geeta has trained girls from innumerable families of New Delhi, and has planted the seeds of culture by taking on the responsibility of shaping their daughters into skillful Bharatanatyam dancers. One could feel and see the pride of the parents as their daughters danced in glorious abandon. The two day events at the IIC commenced with the launch of a new book by Leela Venkataraman. As a critic for over three decades, she has deep knowledge of various classical forms and has now focused her writing on the Renaissance and beyond. Beautifully illustrated, this elaborate book published by Niyogi, is a definitive work and a must read for all students of Indian dance in all its variety. 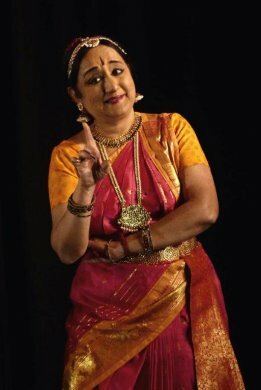 Leela has worked hard to provide extensive information and insight into six classical dance forms, their growth in the twentieth century, and the people who made the process possible. Every dance school must have a library and include such books so that students get an idea of various Indian dance forms in relation to their own discipline during the most important modern era. Geeta Chandran’s students performed both her choreography and their own! 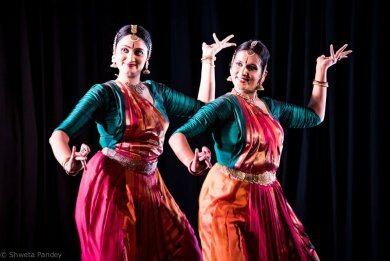 Using the geometric majesty of the Bharatanatyam technique, they wove patterns in twos and threes to use space and time on the stage with alacrity and fluidity. The showcase by the senior students was very creatively highlighted by the lighting designer. Costumed in the Geeta Chandran style, designed by Sandhya Raman, the girls were truly sculptures of the classic Indian temples come alive. A visual treat indeed. The dancers had an extraordinary energy which informed every little move they made on the stage. The grammar of Bharatanatyam is tough. To make just the lines appear clear is not enough. The youngsters understood this and extended the scope of their dance to create unusual patterns which were architectural in concept, and infused rasa in the eloquence of perfection. They sure seemed to enjoy their dance....ensuring that the audience reacted likewise. Geeta is one of few who can sing beautifully. As she sang accompanied by two senior students, the others did leaps and glides on the stage like inspired gazelles. The Natya Vriksha Dance Company is positioned for big recognition and opportunities. And gen next is preparing to step in soon, inspired by the teacher and senior dancers. My lecture on Rasa had a very good audience response. I had a very heady mix of eminent artists and cognoscenti, as well as students and writers in front of me, making me a little self-conscious too. I had prepared a power point program, with all the Rasas, the Vyabicharibhavas, etc. well laid out. And then I saw my audience....and changed track instantly and wisely. I discarded the power point (will certainly use it to good effect when I lecture to you, diligent students of dance!) and started lecturing about Rasa as my own experience, and of imagined and real beauty, and about unforgettable emotion inspired by equally memorable poetry. Later I did a few excerpts from my recent repertoire to show not only the inevitable impact of Sringara, but highlighted others like Karuna, Bhaya and Bhibatsa. I emphasized that our classic literature is the library for us to explore. Any of the many Ramayana writings provide us with texts for portraying any Rasa. A happy complement to "talking" the dance was a little dancing too. My short excerpts illustrated some points, particularly in relation to Sanchari and Sattvika Bhavas. Demystifying the theory of Rasa was my main thrust. Dear students, you may look forward to more such lectures from me! It is very, very heartening to know that a private university - Alliance University of Bangalore - has recently launched department of Performing Arts studies. Dr. Vasanth Kiran who heads it, is a dancer and teacher who has done his MBA. He straddles two worlds.....corporate/academic, and artistic. A symposium can throw up many ideas, and many suggestions. This is what this symposium did and I do hope it will be useful for the university to fine tune many aspects of their performing arts program. The panelists were moderated by Dr. Sunil Kothari who has been faculty member with Rabindra Bharati University, and has his PhD. from Baroda University. The other academic on the panel was Dr. Anuradha Jonnalagadda from the Central University, Hyderabad. Geeta Chandran, performer and teacher, guru Vempati Ravishankar, Ananda Shankar Jayant, and myself were the others who made well prepared statements and discussed key issues on dance education, academic and institutional perspectives, as also changes in teaching traditional dance forms. It was the collective experience of the participants which contributed to the meaningful proceedings. I wish the department and the Chancellor Dr. Madhukar G.Angur success in their enterprise. Academia is not always linked well to the Arts. Particularly in India where the need to do so is very vital today. This new University has come forward with a distinct sincerity of purpose. I saw impressive performances by young dancers, some of whom were employed in companies like TCS, and who were taking a diploma in dance, their original passion! Such inclusive education is the need of the hour. I wish them well.